For any further questions, please visit our contact page. It is not a problem. That's why you've come to visual identity experts who are eager to help you develop a perfect logo for your company. In your design brief give us as much information as you can about what you need and what you like, and be confident that we will "Wow!" you. We want our clients to be completely satisfied, that's why we offer a 100% satisfaction guarantee. That means we will continue to revise your logo design until you receive exactly what you need, at no extra charge. We will send you 3-4 initial designs to start our conversation. Once you review the designs, you will be able to either choose one of them as a basis for further development or to explain us why these designs don't work for you. Having better understanding of your needs, we will continue sending you more targeted drafts until you see the one which you can live with. See "How It Works"
Are there extra fees for extra colors or effects? Never. You can choose any colors and any special effects you want in your logo. When will I receive initial logo designs? You will receive the first logo designs in 3 business days or earlier. We will email your logo files along with the usage manual, so you will be able to start using them immediately. Yes. You will receive Web-ready files (GIF and JPG) of different sizes, so you can easily use your logo on your website. We will provide you with files for any purpose, including vector AI and EPS, high-resolution TIFF for print, Web-ready JPG and GIF, and more. We will also deliver you any other files you may need upon your request. You will be able to use your logo anywhere you need - on stationery, billboards, coffee cups, emails, shopping bags, TV commercials, t-shirts, and much more. Why do other logo designers offer logo design service at $149 or even $99? It's possible that they use clip art or recycled designs, or simply copy existing designs. At Apexity, we create 100% original and unique logos for our clients. Furthermore, we offer unlimited designs, unlimited revisions, as many colors and effects as you prefer, and any formats you need. 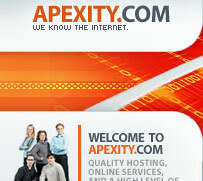 With Apexity, you can be confident that the results will be worth it. Your location is not a problem. We have designed logos for companies from all around the world. The Internet enables us to work with clients in almost any country. If you prefer not to pay by credit card, we accept PayPal, and wire transfers. You will receive full ownership rights to your logo upon the full payment.